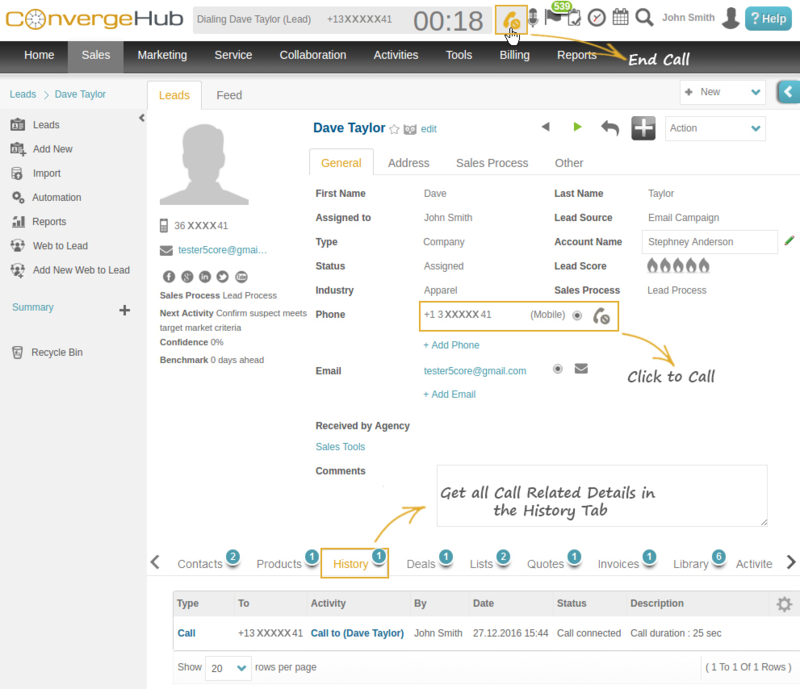 RingCentral Within ConvergeHub – A Smarter Way To Manage Calls bought success for many. 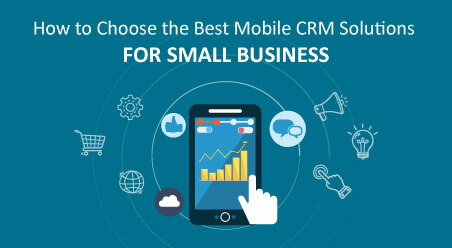 There have been multiple occasions when we have switched between CRM and telecom systems, only to wish if these two applications could be merged. How time saving would it be then?? ConvergeHub continues to invest heavily in strategic partner integrations to improve workflow and productivity and help save customers’ time and money. 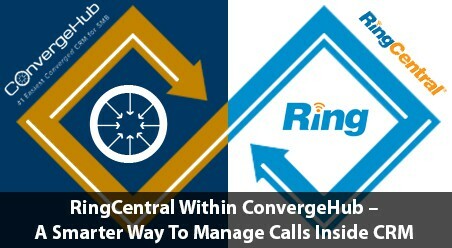 The integration between ConvergeHub and RingCentral is the latest example of this endeavor. 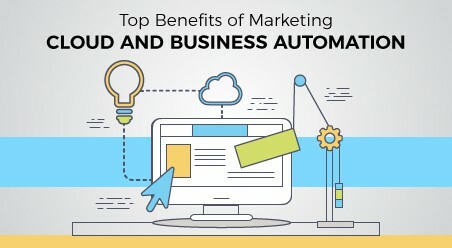 It offers an unprecedented level of control and insight to businesses seeking advanced combination of cloud communications and CRM functionality. RingCentral is used by over 350,000 organizations to communicate and collaborate, boost workforce productivity, share knowledge, and strengthen customer relationships. 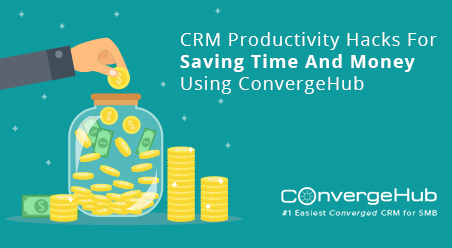 On integrating with RingCentral, ConvergeHub is happy to introduce the feature by which its users can dial and log calls through RingCentral inside CRM in a smarter way to enhance the productivity and enrich customer interactions. 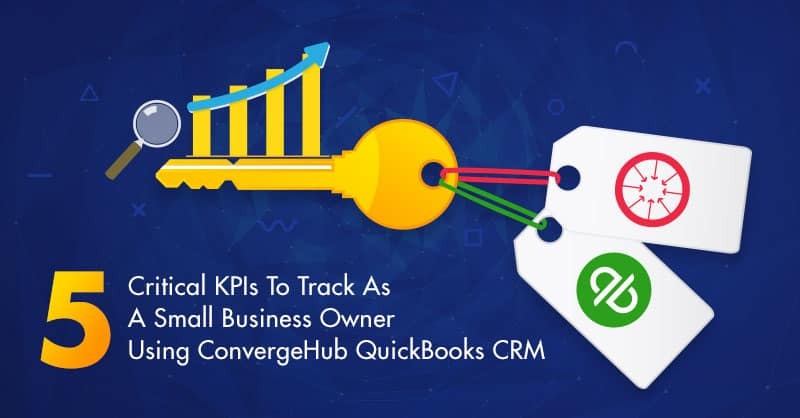 This integration between ConvergeHub (#1 easiest converged CRM for SMBs) and RingCentral (leading cloud communications system) is perfect for small businesses who want to have a reliable voice service inside their CRM and efficiently manage customer phone calls. 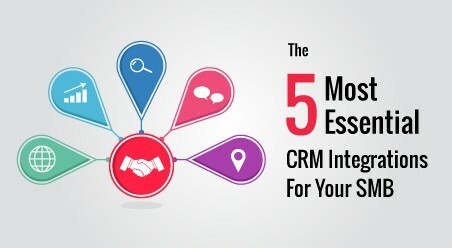 Initiate calls to your CRM contacts with a single-click. No more the hassle of switching between different devices or screens. Time saving! View the dialed customer number. Check the timer to see the duration of the conversation. Click on “End Call” icon to disconnect the call immediately. Acquire all relevant information pertaining to the lead or contact in the sub-panel and be more prepared to ensure quality customer interactions. Understand the context of the conversation beforehand, provide a personalized approach and deliver a great customer experience. Turn your calls into deals. 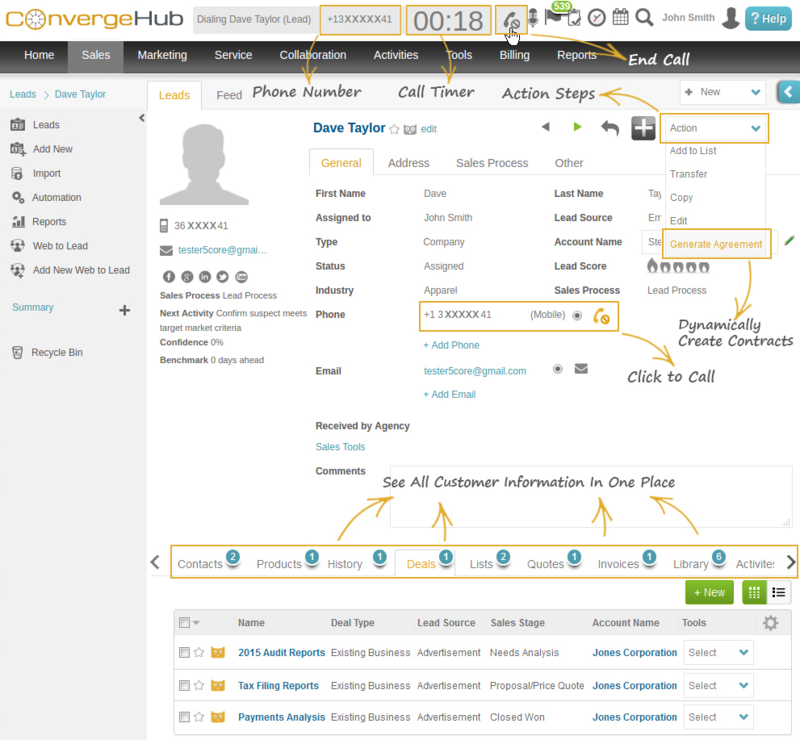 Dynamically create contracts within ConvergeHub CRM while being on call with prospective customers. Keep track of all customer conversations with automatic call logging in the History tab. In one glance, know who called to whom, at what time and date and for how long. Use these call details and analytics in the CRM for future reference. 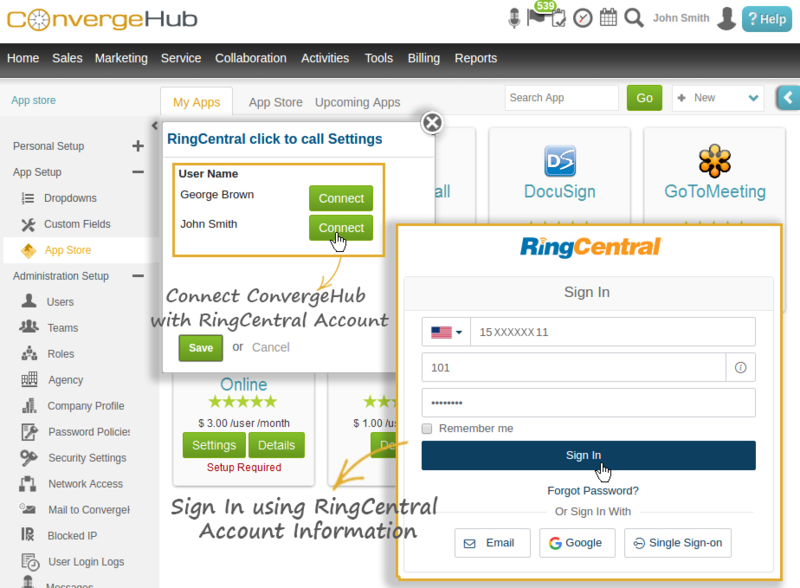 Integrate RingCentral with ConvergeHub in minutes. No installations or tedious configurations to mess with. All you need is your RingCentral login credentials to get started. 1. 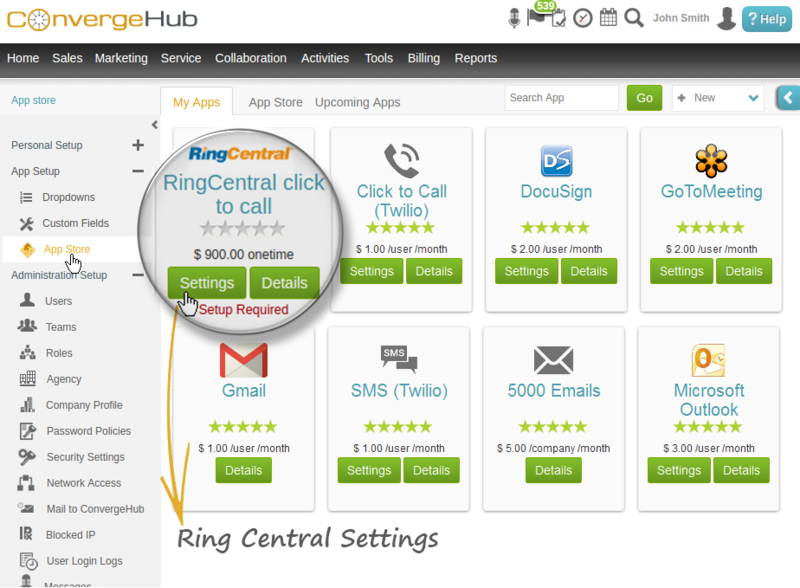 Go to ConvergeHub App Store and read details about RingCentral app. “Setup Required” message will show because no user is connected to RingCentral. Click on Settings to start the integration process. 2. In the settings page of “RingCentral”, all users are listed and beside each of them, there is a “Connect” button to connect the user account of “ConvergeHub” with “RingCentral” account. Click on the “Connect” button to open a popup of “RingCentral Sign In”. Put username, extension (optional) and password of RingCentral account and click on “Sign In”. 3. ConvergeHub is now connected to “RingCentral” and so “Setup Required” message does not show anymore. Add Account Number and Phone of the connected user. 4. Click on the call icon beside the phone number of any CRM contact to initiate the outbound call via “RingCentral” account. It will dial both the Agent and Customer phone numbers and connect them together. View the phone number and the duration of the conversation. See all customer information in one place to interact better. Click on “End Call” icon to disconnect the ongoing call. Tip: If required, dynamically create contracts from within the details page itself. 5. Once the call has ended, find details of call status and duration logged in the “History” tab in the sub-panel. 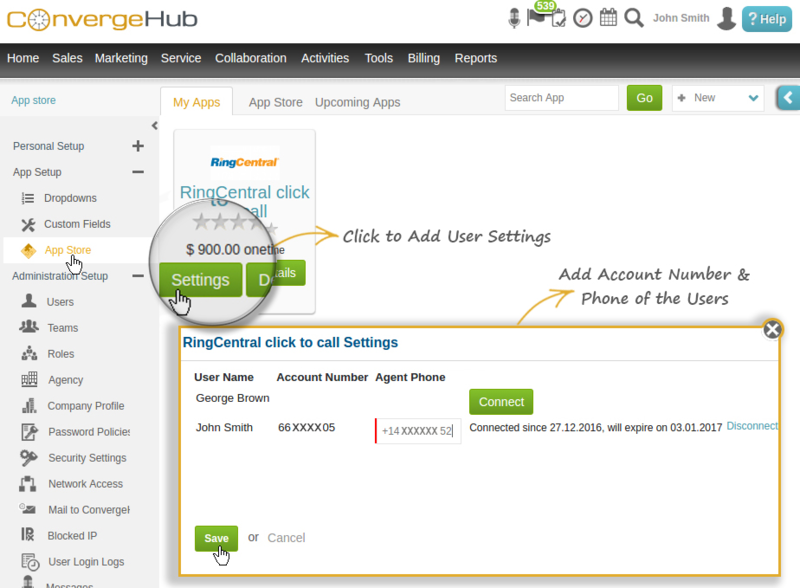 Go ahead and use RingCentral within ConvergeHub CRM to offer better customer experience while receiving or making phone calls. Single-click dialing, access to contextual information during calls and automatic call logging will empower you to smoothly manage all call-related activities within the CRM, build better relationships with customers, save time and add workflow efficiency. Sign up for ConvergeHub CRM now. 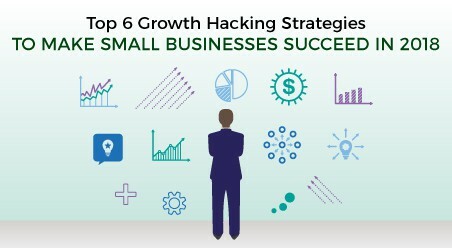 Be one of the many thousands of businesses already using ConvergeHub to manage their entire operations. Easy and effective – the best part is you get started with it in minutes.